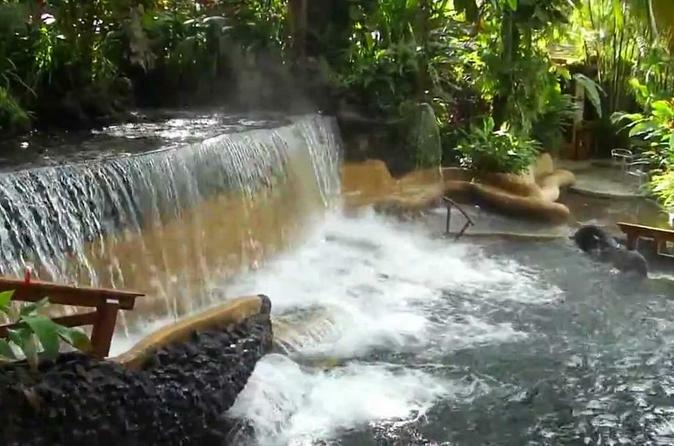 Visit Arenal Volcano (Volcan Arenal) and the nearby Tabacon Hot Springs on this private 12-hour tour from San Jose. With a naturalist guide, you'll see and learn about the active volcano, located near La Fortuna, and then enjoy a relaxing experience at the hot springs, where you can try pools of varying degrees. Dinner and lunch are included. Your day trip starts with hotel pickup in the morning in San Jose by private air-conditioned vehicle for the drive through the Costa Rican countryside to Arenal Volcano. Admire its setting next to Lake Arenal, surrounding by verdant forest, and learn about its activity from your naturalist guide. If the volcano is 'sleeping' and not offering much to see, there are activities in the area such as the rainforest, waterfalls, lakes, and rivers. In your tour vehicle, drive past agricultural plantations and cattle ranches on your way to La Fortuna, where you'll have lunch at a local restaurant with a view of Arenal. Later in the day, head to Tabacon Hot Springs, where thermal waters create a relaxing attraction amid the fresh rainforest air. Geologically, the resort's natural springs are 97% rain based and 3% magma based; when rainwater enters the earth through cracks on the surface, it's heated by magma from the core and then rises to the surface, taking minerals from the planet's rocky stratus. There are five different springs throughout the property of the resort that range from 77 degrees F (25 degrees C) to 122 degrees F (50 degrees C). Find the temperature that suits you for a soak. Dinner is served at the main restaurant before the return drive to San Jose for hotel drop-off.